"She also was proud of the Johnny Mercer Academy Award winning song she sang with Bing Crosby, In the Cool Cool Cool of the Evening. Every once in a while when she was having a dinner or party before she became ill, she would go right into singing the song. She still knew all the words. She enjoyed not just singing but listening to music. Composer Michael Feinstein would often visit and spend an afternoon playing piano and singing for her. "Besides being an avid reader, when she lived up north in the Carmel area, she painted. She did beautiful, very small, miniature paintings. There are a few of them still around, and they're very good. Zantman Galleries  http://www.zantmangalleries.com  in Carmel used to sell her paintings. She would paint with a high-intensity lamp. That became her pastime. But when she moved from Carmel to the Santa Monica area, she gave up painting. Jane was always a loner and became more reclusive. Her daughter Maureen urged her to move to the desert where she had several friends. She became involved in desert activities." Nolan Miller, longtime Hollywood friend, dress designer for movies and QVC shopping network costume jewelry and clothes designer, was very close to Jane for many years to the end of her life and visited her regularly. He did all the costume design for Falcon Crest. "We’ve been friends about 40 years. The way I met her, I received a call one day from Helen Rose, a very famous costume designer from MGM Studios. She said, "I’m going to do you one of the biggest favors anyone will ever do for you. I’m sending Jane Wyman to you." I said, "Oh, thank you." I had a meeting with Miss Wyman; she was going to do a musical and the clothes were to be very glamorous. I still have the sketches. She approved all the sketches. Then she got very ill, was in the hospital and the movie was cancelled. But it was the beginning of a 40-year friendship. "Jane was one of the first major stars that I worked for. We got to be wonderful friends. I designed for her for everything, from Academy Awards to films to anything she did. "And what an amazing career! She worked her way up, starting as a chorus girl, was in musicals and went to dramatic film. Then she easily did musical comedies, like the ones with Bing Crosby. "In the beginning of television, everyone poo-poo’ed it and said it would never last. Well, she realized it was not just a passing fancy. She was one of the first people to not only star in her own series  The Jane Wyman Theatre; she produced it. 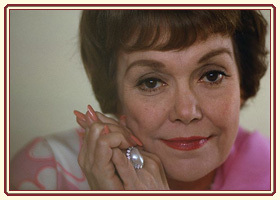 "She was always looking for new material for the Jane Wyman Theatre TV series. She read a story in a magazine, liked it and asked if the studio could buy it. They bought it and her writers tried to do the script. But she said it lost all its charm. She told them to find the writer who had written the original story and see if he could write a script. He went to see her and said he could definitely write a script. And it was the first thing he had ever sold. It was Aaron Spelling. It was called A Twenty Dollar Bride and appeared on television in 1957. "She was very on top of everything. When she was doing Falcon Crest, she was involved in every aspect of the series. "Janie could have easily been a director because she wasn’t very patient. For example, one time I was going with her to a party given for Prince Ranier and Grace Kelly. Her driver fell ill at the last minute, and she asked me to drive. Well, she had a Rolls Royce and I had never driven one. I was fumbling with the gears. And she said, 'Oh please.' She reached over and put it in drive. She said, 'Now drive.' When we got to the party, she reached over and put it in 'park,' which was kind of funny because photographers were hanging all over the car. So we laughed about that a lot. An amazing woman. "She has been most generous because I do a costume jewelry collection on QVC and she has loaned me several pieces which I duplicated. One in particular, she had a beautiful camellia made of fresh water pearls. That was the signature for Lucy Gallant, a movie she made in 1955. She was so pleased with it, she put the real one in the bank vault and wore my copy. "Every time I was on QVC, Jane would always call in to the show. "I miss her. We won’t see people like this pass by again. She and Barbara Stanwyck were two of the most loyal people I’ve ever known and my closest friends for years. "I did the clothes for her last movie, in 1969, called How to Commit Marriage with Bob Hope and Jackie Gleason. It was a substantial part. She was such a pearl. She was at the studio before anyone else. She knew everyone’s lines. It was an amazing experience working with her. "She had a great sense of humor and we laughed a lot. "She loved Michael Feinstein’s music. She had him over to her house many times. He started playing the piano and they were singing duets. He played everything she ever sang in a movie because he’s just unbelievably knowledgeable. She played his recordings all the time. "One night I had dinner at a Palm Springs restaurant with Alice Fay, Loretta Young and Jane. And she sang In the Cool Cool Cool of the Evening. It was a wonderful night. "Jane and her daughter Maureen became very, very close. And it was a devastation when Maureen passed away. Janie missed her very much. " Connie Wald is the widow of Johnny Belinda producer Jerry Wald and a famous hostess in Beverly Hills and Hollywood. Jane Wyman was once quoted as saying: "It’s all in the breaks. I have to thank Jerry Wald for Johnny Belinda. When he was casting the picture, he insisted I do the part. I wasn’t so sure, but he won out and I’m really grateful." "I recall it was the night of the Academy Awards in 1948, the same year that my late husband won the Thalberg award. But Jane’s award was first. Jane had very stiff competition for best actress. We went to the awards dinner together  Lew Ayres and Jane and Jerry and me. And we sat in the audience together. When Jane’s name was called, she was not expecting it. And my husband gave her a poke. She stood up and everything in her purse fell out on the floor. And finally she went running up to the stage to receive her award. And it was a wonderful, wonderful night for all of us. I discussed it with Jane about two years ago when I was down in the desert visiting other friends. "She and my late husband Jerry had a wonderful, long and enduring career relationship together. I first met Jane in her studio days when she was married to Ronnie and my late husband worked at Warner Brothers. They were all close friends in the late 30s, early 40s. "She has earned a special place among American film stars because she had such variety in her abilities. She started as a dancer and singer and gradually became a very fascinating, magnificent actress, as her work in Johnny Belinda showed. It was a beautiful, touching performance. She was a lovely, lovely lady, too." Michael Feinstein  a captivating performer, composer and arranger of his own original music, as well as an unparalleled interpreter of music legends such as Irving Berlin, Jerome Kern, Johnny Mercer, Duke Ellington and Harry Warren  befriended Jane Wyman about 15 years ago. "I met Jane 15 years ago when I was playing for an Arthritis Foundation Awards dinner and fundraiser at the Beverly Hills Hotel and she was the honored guest. I was thrilled to be performing for her and she was the best audience. We spoke briefly after that. "But I didn't really get to know her until Nolan Miller put us together. He had sent her one of my CDs. I called her and she invited me to come visit her in her Palm Springs home. We developed a friendship which is wonderful because she was such a remarkable lady. At 90, she was so filled with life even though she wasn't in the best of health. "She loved music and had great musicality about her. She had a great ear and was a great singer, even though she denigrated her own singing voice. But you had to be pretty damn good to sing with Bing Crosby. She loved Bing. Bing could be difficult, but never with her. He liked to play little jokes on his friends. For example, when Jane and Bing were recording In the Cool Cool Cool of the Evening, she said they sang and filmed it 'live' on the set. Unlike most movie musical numbers, it wasn't pre-recorded. She said he made up lyrics; there are all these couplets and false endings of the song where it keeps repeating the same phrase over and over again. For example, she said he made up the lyric, 'If I can get out of bed with a hat on my head, you can tell ‘em I'll be there.' She said it broke her up because she never knew what was going to come out of his mouth. "I'd go to Jane's house and play her electric piano. She said nobody much ever played it, but it sat there in the living room and whenever I visited, she said, 'Are you going to play the piano for me?' I played and sang for her and she sang along. I pretended like I was Bing Crosby singing with her. I did In the Cool Cool Cool of the Evening with her, and of course that was an Oscar-winning song. It was a lot of fun to sing with Jane. She loved to sing harmony. When I sang a song she loved, she snapped her hands, moved back and forth and had the best time. "Jane told me before her movie career she sang with bands, but never considered herself much of a singer. However, I think she was underestimated as a singer in that she was so recognized as a truly great American dramatic actress that people naturally focused on her dramatic ability. Jane had diverse talents. But as a singer, I think she was absolutely wonderful. She could have made more musical films, but she wisely chose to diversify. If Jane wanted to focus on making musicals, she clearly could have been a great musical star. For example, in Just for You, she is absolutely gorgeous looking and just takes command of the stage. And then in Let's Do It Again, she has some wonderful numbers. "She clearly enjoyed making musical films. She had great musical instinct, great ear and the ability to harmonize easily in an impromptu setting. That's demonstrated very well in a clip I have of Jane and Kay Starr, during a 1959 NBC-TV tribute to Manie Sachs. Jane and Kay did a duet of Side by Side. That was one of Jane's favorite things she ever did. Kay Starr was a real belter. And there's Jane belting right there with her. And again, there's Jane singing with one of the great musical talents and not only holding her own but attracting your attention as much as Kay does. Even then, by the end of the ‘50s, people didn't really think about or remember that Jane was a singer because by that time she was clearly recognized as a dramatic actress. "Jane never gossiped about anybody. She never said a bad word about a soul. She was true to her code. When I asked her about this person or that person, I knew she had a story on the tip of her tongue, but wouldn't tell me. She'd say, 'Well, I can't talk about that.' And then she laughed. "Even at the end of her life, she still loved to smoke her cigarettes. One day I said, 'Ease up on the smoking.' And she said, 'Hey, hey, not you too?' It was as if to say, 'Is everybody going to tell me to stop smoking?' We laughed. She had a wonderful laugh. "Music was a very important part of Jane's life and was one of the things that kept her going, as it does me and it does many people. Whenever I visited Jane at her home, she had the volume turned way up and was blasting my CDs. It got a little embarrassing. According to her staff, she played the CDs non-stop. At one point, I said, 'Jane, can we turn down the music a little bit.' She said, 'No, then I can't hear it.' It was very funny, because even though I was visiting with her, she refused to turn down my own music so we could continue our conversation."